In the pharmaceutical industry, there are many regulations and standards that are imposed on products and processes. Among these are U.S. Pharmacopeia Convention 788 Standard (Particulate Matter in Injections) and the U.S. Food & Drug Administration CFR Title 21 Part 211 (Current Good Manufacturing Practice for Finished Pharmaceuticals). The former standard can play a key role in biochemistry, assay, and formulations departments in both minor and major pharmaceutical companies. Using our particle analysis services (PAS), a formulations scientist submitted a large number of protein samples, along with their specific buffer solution to our laboratory. Their current in-house analysis with a standard non-dynamic flow imaging instrument had been used to detect particulate material. However, they wanted to confirm these counts and obtain the actual images of the particles to see if they could make a determination of the nature of said particulate matter (i.e. protein aggregates, silicone oil droplets, glass vial shards, chemical precipitates, etc.). The first sample we analyzed was the buffer/sample diluent. Although there had never been a previously detected issue with the in-house produced buffer, the FlowCam analysis detected a significant concentration of particles in the buffer. The data and images of the particles were reported back to our customer for evaluation. After a review of the results, the buffer production process optimization and the valuable protein sample analysis was put on hold. With the analysis goal being a pass/fail result when compared to the <788> standard, a high concentration of non-sample (buffer) particulates would certainly confound or even cause a “fail” result for the potential “passing” main protein samples. After another iteration of buffer production and FlowCam analysis, the results confirmed a very low concentration of buffer particulates. These newly produced buffers were utilized with the protein samples to obtain reliable particle concentration data. 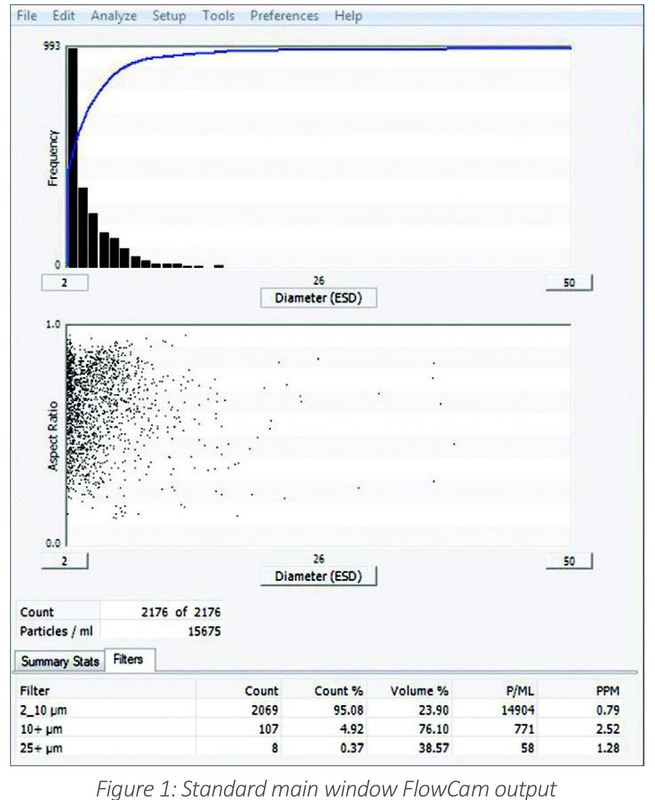 Figure 1 shows a typical report from the analysis of a protein sample. Software filters created to sort the data into appropriate size ranges (based on Diameter ESD) and show the key ranges of ≥10μm and ≥25μm. These filters allow for a quick determination of either a pass or fail result. Selecting the ≥25μm filter quickly pulls up an example collage of those particle images as seen in Figure 2. We were able to not only determine if the protein samples passed the <788> standard but also detected and assisted in the elimination of a detrimental experimental variable (buffer particulates). Without the data and images provided by the FlowCam, these buffer particles may have erroneously been counted/included in the protein analysis. Additionaly, the images of the buffer particles indicated that they were silicon oil droplets. By using our PAS, our customer could quickly troubleshoot their buffer production methodology.